This Monday, February 8, is Chinese New Year. The celebration of the beginning of a new year, according to the lunisolar Chinese calendar, is a significant holiday in countries with large Chinese populations. 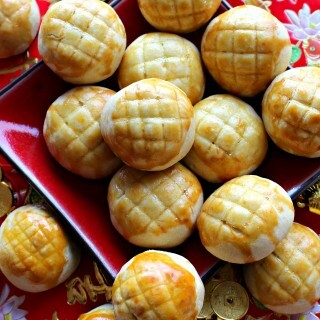 Happily, there are numerous traditional baked treats for Chinese New Year. Some are specific to only one country, and others can be found in many countries. Pineapple Cookies (凤梨酥) are a multi-national New Year favorite. The recipes I found varied slightly in ingredients and cookie shape, but all created melt-in-your-mouth, buttery shortbread with a fruity pineapple center. Many cultures have cookies and sweets that travel well in a care package. The internet puts international recipes at our fingertips. Chinese New Year is an opportunity to discover and try traditional recipes associated with this celebration. Last year, I enjoyed nibbling on Peanut Cookies(花生饼). 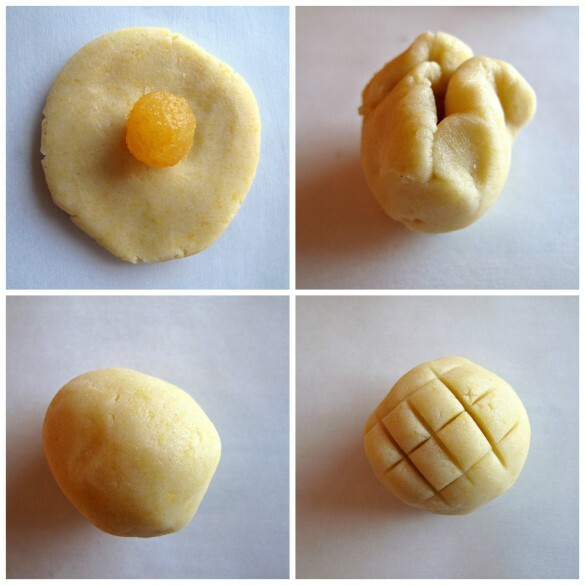 This year, I am delighted I learned to make Pineapple Cookies (凤梨酥). After researching, I decided on 3 pineapple cookie recipes to try. I chose them for their authenticity and my familiarity with their authors, but I was frustrated that all of the recipes required making the pineapple jam filling. I worried (unnecessarily, it turns out) that making jam would be too time consuming or complicated. There are two large Asian grocery stores close to my house that I was sure would carry jarred or canned pineapple jam filling. They were right, of course. Making pineapple jam filling for New Year’s Pineapple Cookies is not only easy, but takes only about 30 minutes! For ease and time saving, I used canned pineapple. I read that fresh pineapple tastes even better. It probably does, and at some point I may compare fresh with canned. The canned pineapple, however, is quick and easy and makes a delicious jam. The pineapple chunks are drained, then hand squeezed to remove as much moisture as possible. The less moisture that remains, the less time it takes to cook down into jam. The drained pineapple is pureed in a blender or food processor. The puree and some sugar is then stirred over medium heat until it thickens into jam. Easy. No wonder the grocery managers rolled their eyes at me! The shortbread-like dough comes together quickly kneaded by hand, or even quicker with an electric mixer. The dough is smooth like playdough and easy to work with. Traditionally, no flavoring is added to the buttery cookie, but an optional bit of pineapple flavoring boosts the fruity flavor. 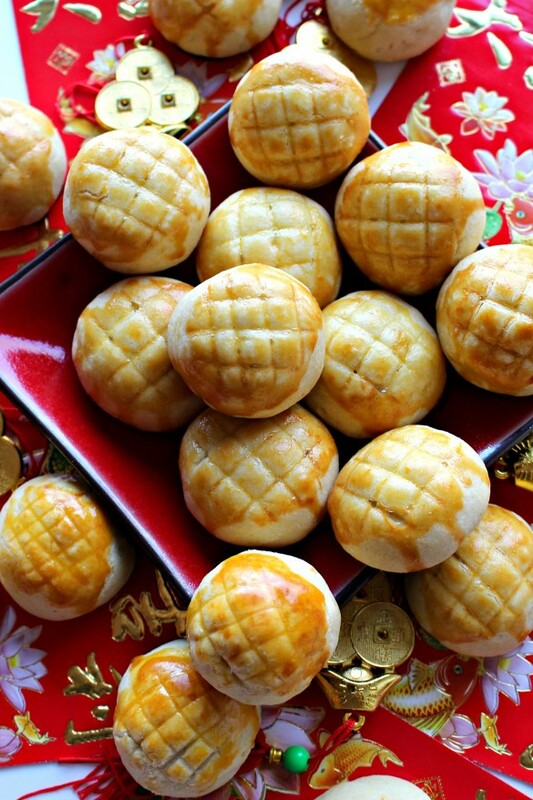 These Pineapple Cookies (凤梨酥) are delicious any time of year. They are only mildly sweet, like most Asian cookies. If a sweeter version is desired, add a sprinkling of decorating sugar or a drizzle of confectioners sugar glaze on top. For celebrating Chinese New Year, or just for enjoying with a cup of tea, Pineapple Cookies are an international treat to be savoured. Drain the canned pineapple, and then, using your hands squeeze out any additional juice. In a blender or food processor, puree the pineapple for 10 seconds. In a medium saucepan over medium-low heat, combine the pineapple puree and ¼ cup sugar. Mix continually with a wooden spoon until thickened (approximately 30 minutes). Set aside to cool. Preheat the oven to 325°. Line a baking sheet with parchment paper. In a large mixing bowl, whisk together flour, cornstarch, salt, and confectioners sugar. In the bowl of an electric mixer (or in a food processor or by hand) combine the flour mixture, butter, 1 egg yolk, and (optional) pineapple flavoring until a smooth dough forms. 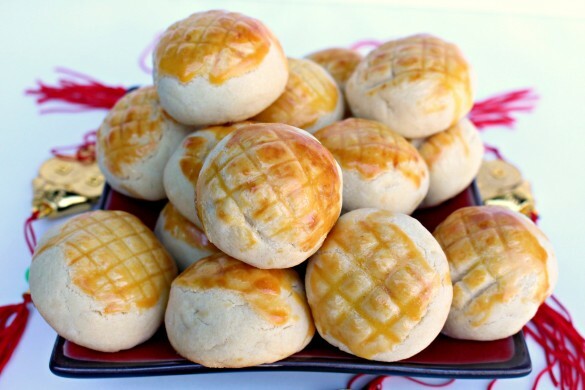 To make cookies, first prepare balls of pineapple filling. Scoop 1/4 heaping teaspoon of filling and roll into a ball. Roll 16 filling balls. Use a small scoop or 1 tablespoon, to scoop a ball of dough. Flatten the scoop of dough into a disc shape and place a filling ball in the center of the dough disc. Wrap the dough around the filling, and roll the dough into a ball. Place the filled dough balls on the prepared baking sheet at least 2" apart. Press the back of a butter knife into the dough ball to create a criss-cross pattern. Combine the egg yolk and condensed milk to make an egg wash.
Brush the top of each cookie with the egg wash.
Bake for 18-20 minutes or until the tops are golden brown and the bottom edge begins to brown. Allow to cool on the baking pan for 5-10 minutes before transferring to a wire rack to cool completely. Store cooled cookies in an airtight container at room temperature for up to 1 week. Double wrap pairs of cookies, bottoms together, in plastic wrap. Place wrapped bundles in a freezer weight zip lock bag or plastic container. I love that you made these and made the filling yourself! Great post! Wendy, I always learn something new from you! Who knew it was so easy to make pineapple jam? These pineapple cookies are adorable and anything with shortbread is perfect in my world. Well, then we have a learning exchange going on, Cindy! I do like to dabble in recipes that are off the beaten path! 🙂 Not only is the jam/filling easy to make, but you can roll it into little balls for easy stuffing into the cookie! (I am thinking pineapple hamantashen?) I am a major fan of shortbread, too. Isn’t it interesting how many cultures enjoy shortbread?! These looks so great, Wendy! I’m afraid of making jam too, but that does sound easy. I don’t think there is a better cookie than a buttery cookie with a tangy jam. Yummy! Oh these sound so interesting and delicious! I don’t think I’ve ever had a cookie like this before! But they definitely are right up my alley!! That pineapple jam … makes me think of our honeymoon!! These cookies are wonderful with a cup of tea, Ashley! 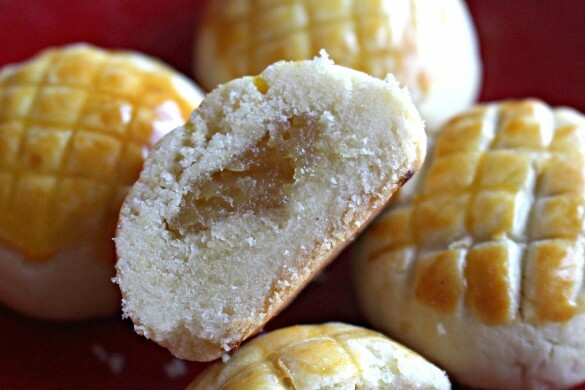 They are like little balls of shortbread with the added bonus of a pineapple center. Shortbread seems to have an international following! Wonderful of you to spotlight different cultures and their important holidays! 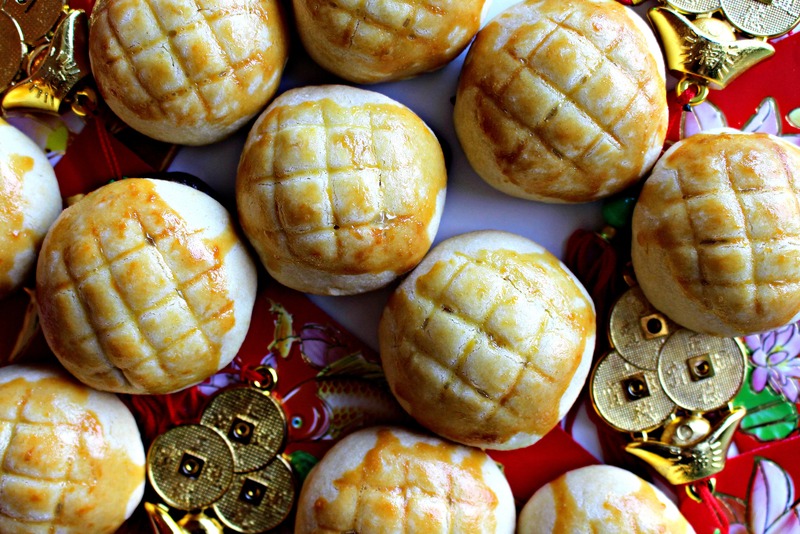 My husband loves the pineapple buns at the Chinese bakery and for ages, I never thought about why they were called that (there was no pineapple filling). Anyway, those have a crackly top but look much like these. I’m so happy to learn that pineapple jam is this easy to make and these cookies are truly special. I wish I had cookies like this growing up! Thanks, Monica! 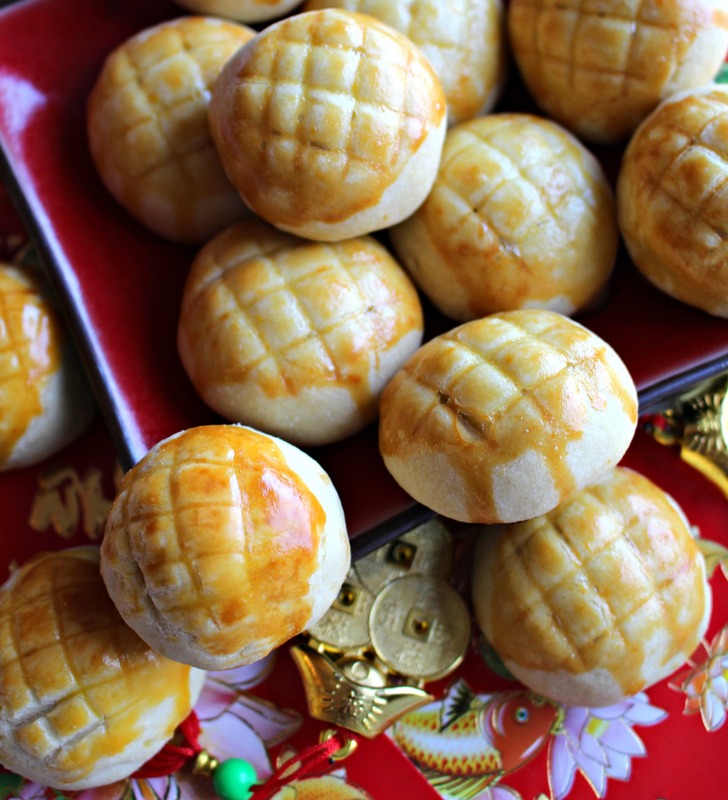 You and your irresistible recipes started my fascination with Chinese New Year recipes several years ago (glutenous rice balls in brown sugar soup)! I love learning about international recipes and trying them out. 🙂 In my research, I read about pineapple buns that were yeast buns with a cookie like covering that crackled when baked (no filling). They looked delicious but yeast dough is usually not care package friendly. Instead I made these with their shortbread-like dough. Great care package cookies and great cookie jar cookies! What a fun and interesting cookie project. I love this part of blogging – learning about new traditions and recipes I would have otherwise missed. Your photos are fantastic Wendy. I would love to try these! Thanks, Tricia! I love discovering international recipes that not only are delicious, but are good for care packages! So many cultures seem to have variations on shortbread. I think it would be fascinating to be a culinary anthropologist and trace the origins of recipes. Thank you so much for your sweet words about the photos. I am making myself use my DSLR and the learning curve is steep! Thank you, Reeni, for your very kind compliment! These little shortbread bundles were new to me too. Like most Asian cookies, they aren’t very sweet, but the lightly sweet, buttery flavor is perfect with tea! I am excited to try these! This is a great post! Thanks, Helen! I love trying international recipes to experience new flavors and traditions. These are some lovely looking cookies! I love pineapples. I bet these are delicious! I’ve got to give these cookies a try! Thanks for linkin’ up with What’s Cookin’ Wednesday! Thank you, Karly! These were fun to make and to eat! Thank you for hosting What’s Cookin’ Wednesday. These look super yummy! I’ve never had any kind of pineapple cookie (which is crazy because I love pineapple) so I can’t wait to try these. Thanks for sharing with us at Merry Monday! Thanks, Marie! I fell in love with pineapple jam while making these cookies and was amazed that I had never had it before! Thank you for hosting Merry Monday! This is a very unique recipe and it looks delicious! Thanks, Julie! It’s fun to find international recipes that are delicious and great for care packages too! 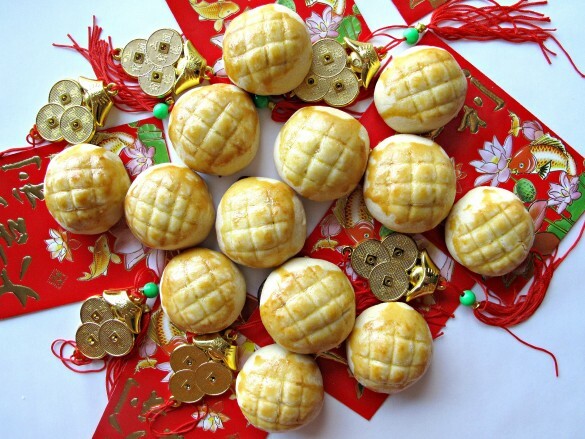 Pineapple cookies are unique to us, but common in places that celebrate the Chinese New Year! Delicious cookies I need to make it. thanks for sharing with Hearth and soul blog hop. Pinning. Thank you, Swathi! The pineapple jam was surprisingly easy to make. Thank you for hosting Hearth and Soul and thanks for pinning! What a great cookie for this special celebration. Thanks so much for sharing this awesome post with us at Full Plate Thursday. Have a great week and hope to see you again real soon! Thank you, Miz Helen! The pineapple jam is delicious! Thanks for hosting Full Plate Thursday! I hope you have a great week! These look amazing and my teen will love making them for her class. Thank you! Thank you, Joyce! I hope your daughter has fun making these and her classmates enjoy them. I was a little intimidated by the idea of making pineapple jam, but it’s actually really quick and simple! Your Pineapple Cookies look lovely, Wendy! I’m always looking for a light, fruity dessert to serve after Chinese food – and these are perfect. Sharing on the Hearth and Soul Facebook page tomorrow. Thank you so much for being a part of the Hearth and Soul Link Party. I’m making these for a late Chinese New Years party Saturday(sickness prevented a party on the actual day). My filling turned out ok but the dough is really really dry and crumbing. Any suggestions? Thank you! Hi Jenny. I am sorry to hear that your dough isn’t holding together. It sounds like maybe you used too much flour? Unfortunately, American recipes are in volume rather than in weight. If we all used kitchen scales, the outcomes would be more consistent. The best way to measure flour is to spoon it into your measuring cup and then level off the top. Scooping flour packs it into the measuring cup and then you end up with more flour than required by weight. I am not sure what happened to your dough, but you need to add a little bit of moisture (bit by bit) until your dough comes together. You could use water, milk, juice, vegetable oil (or a combination). I hope this helps and your cookies are rescued for your party! You know I love all of your baking and these look really special!! I have chosen your post from Friday Features Linky Party 2/16 to feature on this week’s party. It is also going to get a boost on my Instagram account, so watch for it. And it is pinned on my Friday Features Pinterest Board!!! I appreciate that you stop by to share your awesome blog with us each week! Goodness these look so delicious! So glad you shared this recipe with us at Merry Monday. Pinned. Hope to see ya next week.